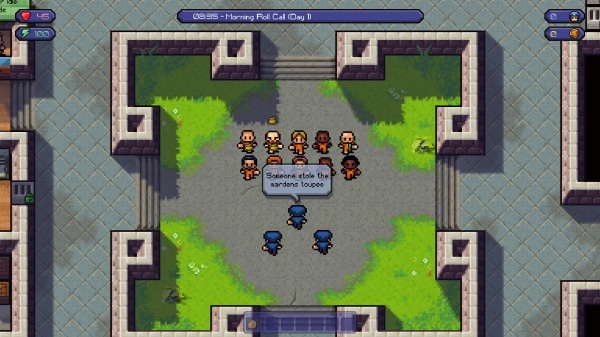 The goal of The Escapists is in the game's name, escaping. You play as an inmate in a prison facility and must develop an escape plan, gather the materials necessary to put it into motion, and then execute it successfully. A short tutorial level introduces you to the basic options at your disposal - trading with or stealing items from fellow inmates, crafting those items into tools, and keeping your activities hidden from the guards. The handholding that you receive during this tutorial coupled with the speed and ease of your escape may have you thinking that they can't build a prison that can contain you. That will soon change. First of all, the thrill of making your escape is only there when you're actually making your escape, it will take you quite a bit of time before you're ready to make it, and that time will be filled with the monotony of the daily routine of a prisoner. Morning roll call, breakfast, work time, lunch, exercise time, dinner, evening roll call, bed, wake-up, repeat. Each day will involve spending a little bit of time trying to figure out a way to escape and putting all of the pieces of your plan into place, and a whole lot of time of going through the motions of a prisoner's daily routine. Maybe that's the reality of life in prison, but it doesn't really make for compelling gameplay. In between standing in a yard listening to a guard call off prisoners' names and grabbing a tray at the cafeteria, your path to freedom will involve trying to get your hands on items. While some of these things are there for the taking - you can get your hands on a guard uniform by working a shift in the prison laundry - most will need to be obtained or stolen from other prisoners. Some will part with an item for a little cash and some act as merchants with a whole collection of items for sale, while others will offer cash or items in exchange for a favor. You'll spend a good portion of your time doing favors for other prisoners, but the game doesn't make it easy for you time or efficiency wise. You can only have a couple of tasks active at once, which doesn't really make sense from any perspective other than that of an unfortunate design decision, and they are often tied to a particular time of day. For example, a prisoner may ask you to create a distraction at breakfast and if you're already past breakfast that day you'll need to wait around until the next day to complete your task. There are also tasks that require you to attack another prisoner. Your target won't take too kindly to your unprovoked attack, and you're pretty much guaranteed to be attacked by that prisoner every time he sees you from there on out. And you won't be getting an opportunity to do that guy any favors any time soon. Once you've got some items you'll have the chance to craft them into tools or weapons useful to a prisoner looking to escape. How you make those items will take a lot of experimentation, though, and most items that you try and combine won't make anything. Things are made more complicated by the fact that some of the more useful items will require that you combine more than two items, and so you've got more possible combinations to work your way through before you find something useful. Crafting in the game requires a lot of patience and a healthy tolerance for failure. As a prisoner you've got to be careful to give the impression that you're toeing the line as a model prisoner. Catch the attention of the guards and you could find yourself being thrown into solitary for a few days, and having all of the items on your person confiscated. You do have the option of stowing some of your stuff in your cell, but guards can search your cell as well and if you have anything that they don't like they'll take it from you. Needless to say, having items confiscated can be a pretty big setback, and it can take you weeks of prison time to get your hands on the component items that you need to craft what you've lost. The concept behind the game, escaping a prison by formulating a plan and crafting the tools to do it, is an interesting one. I also like the way that the game gives you the freedom to make your escape in different ways - there's no one set 'solution' to each level. However, the game makes you spend way too much time going through the daily required prison activities and killing time waiting to perform a task. I didn't find it fun to spend so much time with the game in which I didn't really feel like I was getting anywhere, or even playing a game, really. The craft system is also far too reliant on brute-force guesswork that will try the patience of many gamers - I know that it certainly tried mine. 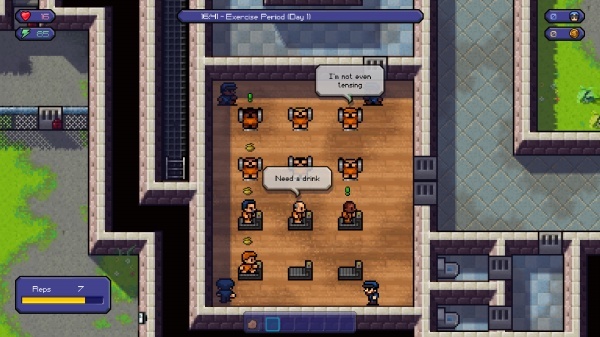 The Escapists just doesn't make its concept work as an enjoyable game, and most gamers are simply going to find it too tedious and too frustrating to have any fun with the game. Final Rating: 60%. Just like in life, the best way to avoid prison game monotony is to avoid prison games.